Robert F. Kennedy campaigned for peace on a platform that courageously opposed the policies that his brother set in motion. 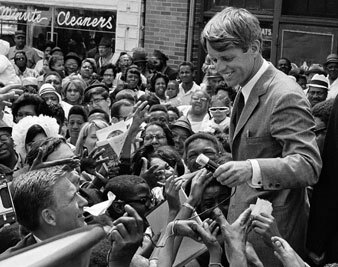 Sen. Robert Kennedy campaigns in Indianapolis, May 1968. Three views of a man who was killed just when he was coming into his own. In essence, the single point in RFK’s campaign — as in, that of Eugene McCarthy — was that America must come to its senses. And in that lies a tragedy that goes deeper than the bullet. It involves the whole situation of the Kennedy clan, of which only one son of Joseph P. and Rose Kennedy now survives. Robert always lived under the shadow of his brother, and much of the acclaim which greeted him wherever he went, and a large part of the votes which would have been cast for him, were an inheritance from the late President. Robert never stood entirely on his own feet, never entirely freed his own abundant talent from the memory of what John F. Kennedy accomplished and might have accomplished had he been spared. And now, in grim turn, we shall never know what Robert might have accomplished. This was not merely Robert’s personal problem; it concerned his relations to the Democratic Party and to the country as a whole. JFK was, after all, responsible for Johnson, whom he chose for purely political reasons and without whom he would probably have lost in 1960. Thus the policy against which Robert rebelled — and, however long he delayed, he did rebel — was one which he and his brother had put in motion. Rusk, McNamara, Taylor, Lodge and other outstanding hawks, active or acquiescent, were initially Kennedy appointees. It was Kennedy who, in one way or another, gave Johnson the opportunity to involve the United States in a great war on the mainland of Asia and thus by necessity to ignore all the problems, domestic and foreign, that today beset the most powerful of nations. And it was this whole mindless, cruel drift that Robert Kennedy was determined to stop. He was moved by impulses of the most responsible patriotism, but he was also moved by family: the Kennedys are proud. He would secure his brother’s good name by defying, and if possible defeating, the evil consequences that bad flowed from his brother’s brutally interrupted administration. And now a bullet has put a stop to that. Robert Kennedy’s bold stratagem need not die with him, but if it is to survive we must honor the dead man with action, not with repining. The political moratorium, inevitable at the moment of first shock, must be cut short–its continuance serves only the interests of Hubert Humphrey and Richard Nixon, those spokesmen for the discredited machinery of political consensus that RFK was determined to break. Defeat would have been bitter to Robert, but would he necessarily have seen defeat in a McCarthy victory? A few hours before he was shot, he said to a crowd: “It is less important what happens to me than what happens to the cause I have tried to represent.” In all essentials that cause — a politics responsible to the people of the country and the peoples of the world — is also embraced by McCarthy. It is tragically remote from Humphrey’s grasp. But politics is not only principles; it is also manipulation and the flow of human loyalties. The Kennedy forces are for the moment leaderless; it is widely feared that they will disperse and that enough may be drawn into the Vice President’s orbit to assure his victory in Chicago (with the predictable result that Richard Nixon would be the next President). There is, however, still a Senator Kennedy. Edward is less well known, but in a short term of service he has earned remarkable stature. His policies are sound, and — as he showed in his bitter reports from South Vietnam — his heart is stout. Edward Kennedy should now assume, if not his brother’s place, a large measure of his brother’s responsibility. The dedicated men and women who were the sinews of Robert’s astonishing campaign should put Edward at theft head and should seek the con-federation with McCarthy that his brother more than once hinted at as the next necessary step. It might be that he would accept the second position on the ticket, and in that case the tragedy of Los Angeles need not be unrelieved. Eugene McCarthy and Edward Kennedy could very probably beat Humphrey in August, and could almost certainly overwhelm Nixon in November. Failing some such gallant recovery from this current horror, the country will be faced again in 1968 with a choice that is no choice at all. That would be the unrelieved — perhaps the fatal — tragedy. If any example were needed of the corrupting monotone of voice and thought that Robert Kennedy was intent upon replacing, it was provided by Lyndon Johnson’s television appearance on the night when the Senator was dying. He opened his brief talk with a perfunctory and platitudinous expression of shock, dismay and sympathy for the Kennedys. On this score he is not to be much criticized. It is difficult for a public man to utter convincing words of condolence, and Johnson’s task was the more difficult because he could not pretend to any love for the man. But we have been told ad nauseam that LBJ, however ignorant his opinions and ill-considered his actions, truly loves his country. So he went before the country on that tragic, perilous night, and what did he say? He called for an end to violence in the streets and appointed a commission to investigate the causes thereof. Did he mention Vietnam, or poverty, or life in the ghetto, or the frustrated aspirations of every minority group in America? Did he refer to the waste of our resources, the contamination of our environment, the arrogance of our colossal stance on this earth? He cited none of these things: “My fellow citizens, we cannot, we must not, tolerate the sway of violent men among us.” Was there nobody in his retinue to tell him that he indicted himself? He appointed a commission to acquaint him with the causes of violence. If it were sincere, what could such a commission tell him except truths about his own Administration so bitter that he has long since proved himself unable or unwilling to accept them? But this commission will not attempt to drive home any such hard facts: it is itself made up overwhelmingly of men who have supported his policy in Vietnam, men who believe that we can kill without scruple in Southeast Asia and by moral unction and police implacability suppress the consequences at home. No President who had read with seeing eyes the report of the Kerner Commission could possibly require the services of another such body, let alone that of the Milton Eisenhower Commission. But Johnson does not see; his eyes are turned inward to a reality of his own invention, and he responds to events with programed jerks that are faithfully echoed in the articulated gestures of his platform delivery. That is what Robert Kennedy was fighting, and Eugene McCarthy is fighting. So, to borrow one of the President’s favorite apostrophes, “let us, for God’s sake,” put an end to it. And let us remember that Humphrey is its heir and Nixon its only too loyal opposition.